Looking for fun, fishing activities? These aquarium crafts (fish in a bag) and make believe hoola hoop fishing ponds are perfect activities to try after reading one of the Rainbow Fish stories. Rainbow Fish is a fun story about a school of sparkly scale fish who won't allow a little fish without the sparkle to play, similar to the story of Rudolph and the Reindeer Games. This is a great story to teach about inclusion and kindness. 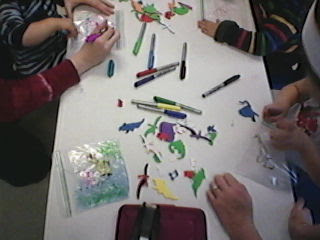 What theme for preschool could be more fun than Rainbow Fish? 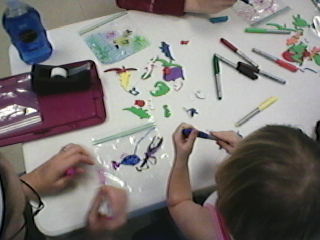 Sharpies and Ziploc Baggie for Aquarium craft project for kids. Fill the aquarium with foam fish or make a dino terrarium. 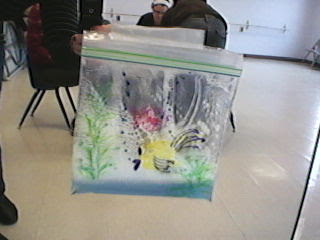 Color an underwater scene on the bag. As an alternative, you can cut out fishy shapes and insert them to slosh around in the goo. Fill bag with about 1/4 C. of gel for a sparkly, ocean effect. For bubbles add a small squirt of shampoo. (Little ones loved squishing and watching the bubbles appear.) Tightly zip bag and tape to window or mirror. Squish away your stress! Gel is sparkly, add a little blue shampoo for fishy bubbles. 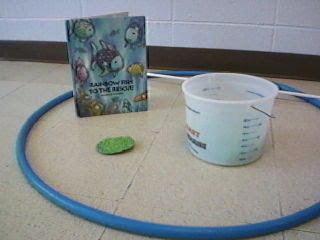 Creative Play Element Fishing Activity: Pretend a Hoola-hoop is a fish pond. Rainbow Fish to the Rescue is a perfect story compliment. it to "its" shirt for Tag. all about the process and the fun of experimenting! We like to add a creative play element. Cut a scale from sparkly foam and tape to shirts. I adore this beautiful clay and sequin rainbow fish craft activity from Sun Hats and Wellie Boots. 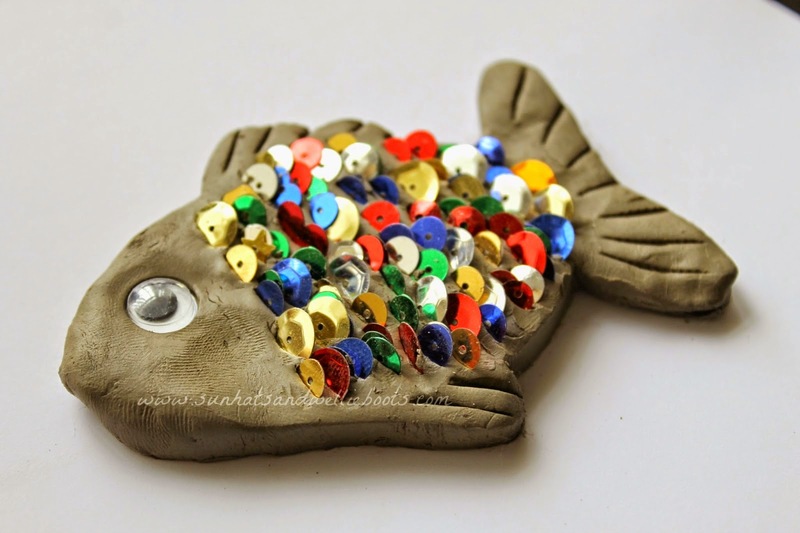 Sequin and Clay Rainbow Fish Craft Activity. oh so much fun. I agree it is all about the fun!! They grow up so fast. Let them be kids and find wonder and excitement in the little things. I want to do this. Fun post! 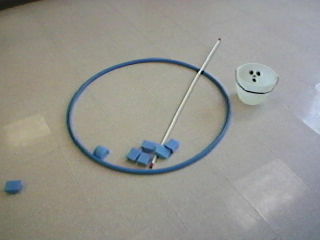 This is a wonderful set of activities! The baggie fish tank is really great! Thank you for linking to Read.Explore.Learn.